In the 1940s, Rosie the Riveter was the nation’s premiere “poster girl.” With her stoic face, flexed arm muscles, and clenched fist, she was an empowering symbol for a generation of women joining the workforce during World War II. She helped women everywhere recognize the role they could play in improving their families, their communities, and the nation. Today, many RDs are becoming contemporary “Rosies,” taking to the airwaves—namely television—to gain exposure for the profession and get the word out about the vital role that proper nutrition plays in Americans’ lives. 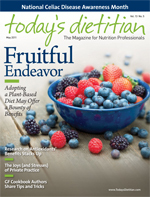 For Diane Henderiks, RD, her role as a national television personality places RDs as nutrition experts while showcasing the diversity of the profession. Henderiks provides nutrition/cooking advice on television shows such as Good Morning America and even on Martha Stewart radio. “As a personal chef and RD, my opportunities are numerous and add to the scope of advice I provide,” she says. Following her national appearances, Hendericks typically receives many e-mails with questions and positive feedback. “I am relatable, and my approach to healthy cooking and eating is ‘gentle’ as opposed to rigid, which makes it easier for my message to get across and for viewers to adopt new behaviors and changes,” she says. Jessica Setnick, MS, RD/LD, CSSD, who has a recurring segment on “Doctor to Doctor” on TBN, also strives to reach an audience that has never seen an RD regularly on air. “My hope is that viewers with emotional eating problems, questions about nutrition for their families, or medical conditions [who] require special diets will see my segments and learn to associate dietitians with helpful, practical information,” she says. Henderiks has a lot of creative control over her segments and is responsible for developing the concept of the programs she provides. “I like to take a subject that is trending in the news or media, put my own spin on it, then I ‘set the record straight’ on TV,” she says. Setnick’s favorite strategy is to phrase her topic as an imaginary viewer question, such as “Why are we supposed to avoid eating XYZ?” and then answer the question as though she were talking to that particular individual. “This way, I am able to present the correct information in a friendly one-on-one manner to the viewer instead of a didactic teacher-to-student ‘today I am going to talk about fiber’ lecture format,” she says. Of course, not everyone aspires to be a television personality. So what can RDs who don’t want to be in the limelight do to promote themselves and the profession? Hendericks recommends contacting local newspapers and offering to write a column, approaching the local gym about availability to offer consults, starting a nutrition blog, using social media to develop a following, or conducting demonstrations in supermarkets and health-food stores. De Fazio does not believe RDs on the whole have done all they can to inform the public that they are the nutrition experts. “I am so proud to be a registered dietitian, and it is time to really let the media know that they should be calling and quoting registered dietitians when they are doing diet and nutrition stories,” she says. Zuckerbrot would like RDs to recognize that whether they are counseling in a private practice setting, working in a hospital, or contributing to a newspaper, they are making a difference in helping Americans get healthier. “A great way to reach the masses is through the Internet. Social media platforms such as Twitter and Facebook help spread dietetics to a broader audience,” she says.